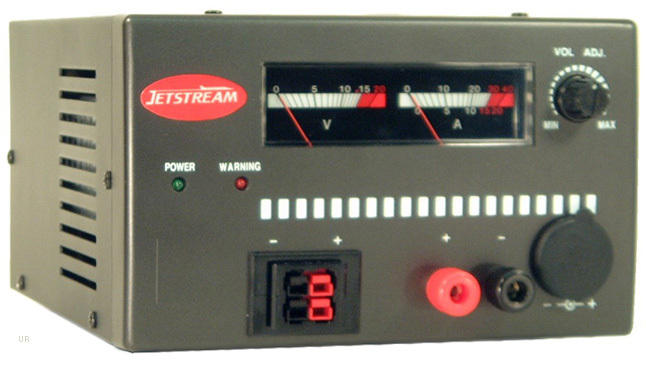 The Jetstream JTPS35BCMA adjustable power supply provides from 9 to 15 VDC at 27 Amps (30 Amps surge). There is a separate meter for voltage and one for Amperage. It features five-way binding posts on the front panel and a lighter plug and spring loaded terminals for low current (7A) accessories. 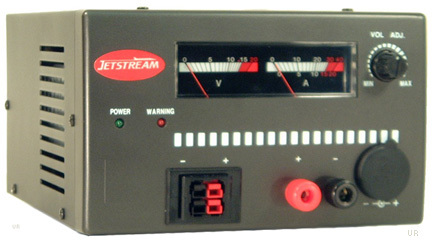 This A version also has Powerpole® jacks. 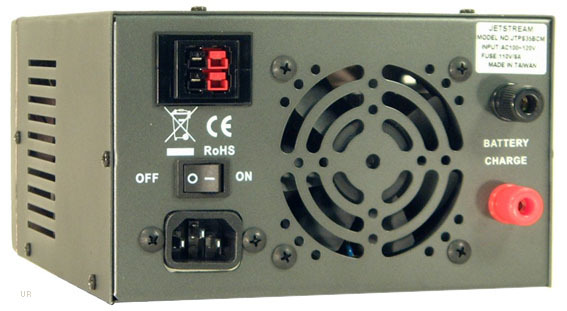 It has over-voltage protection, over-current protection and quiet auto-on internal fan with Warning LED. The rear panel has binding posts for battery backup (battery not supplied) and another set of PowerPole jacks. Input is 110/220 VAC switchable (factory set at 110 VAC).